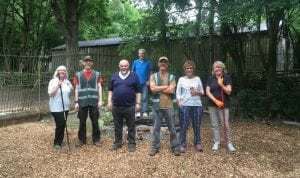 This is a new site for Croxteth Park Volunteer Group as part of their membership of TCV’s Community Network. The Croxteth Park Volunteer Group (CPVG). The CPVG was set up in 2017 to provide support and resources to the park management team in the wake of many council cuts to funding. The achievements of the group are massive considering the short period of time we have been formed, the group continues to go from strength to strength and we are getting significant amounts of feedback about how much better the park is looking, we have cleaned the ponds, built fences, doing numerous litter picks and completely revitalised the Kennels, a Grade II listed building which serves as the volunteer base and is in the process of been lovingly restored by the volunteers. Why not consider joining us? We have a database that we use to send out weekly emails about activities etc, if you would like to be added to the volunteer database please email us and opt in!